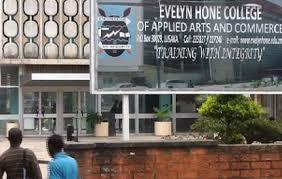 19 students who graduated in Journalism and Public Relations from Evelyn Hone College in Lusaka in 2014 have still not obtained their diplomas, the move has sent them into destitution as they cannot get jobs in spite of having passed the exams and being earlier assured by management that they would get their certificates within two weeks. Mukosela Kasalwe, Coswell Hantuba,Carol Ngosa,Mutemwa Sakala Mutemwa,Hellen Bwalya,Liseli Kanyanga,Maudy Chilongo,Raphael Banda,Monde Likando, Precious Chama,Ruth Kasengele,Patricia Mulenga,Justina Matandiko, Josephine Kapinga,Josephat Mwinilombe ,Esther Walaza,Tobias Daka ,Grace Banda and Mike Mwansa attended one of the country’s higehest institutions of learning from 2011 to 2013 and graduated in 2014 but were not given their certificates. Other students who did not clear all the subjects and were made to re-sit later have since been given their certificates but the 19 victims do not understand their fate. In their letter to Evelyn Hone Principal and Technical Education, Vocational and Entrepreneurship Authority (TEVETA), the students say they have suffered a lot and would now appeal for higher authority to help or shall use other unspecified means because their sponsors have no more money to help them with. The students have also written to Media institute of Southern africa to seek the organisation’s intervention.